Hard-working forward who boasts a booming kick. A junior tennis prodigy, Killian turned to football after suffering a serious back injury as a teen. She represented South Australia at the 2013 Women’s National Championships and claimed the Melissa Backhouse Medal as the competition's rising star. 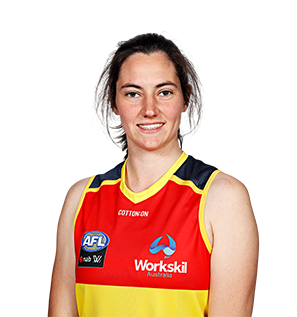 A natural athlete with strong hands, Killian joined the Crows via pick 71 at the 2016 AFL Women’s Draft. Killian lacked continuity in her first season as a Crow but still made an important contribution to the Club’s premiership campaign. She created history by booting Adelaide’s first AFL Women’s goal in the Club’s pre-season trial against Fremantle in Darwin. Killian had to wait until Round Two for her AFLW debut due to a quad injury, but made an immediate impact against the Western Bulldogs with a goal and three inside 50ms from nine disposals. Was forced back onto the sidelines in Round Five but returned in time to play a key role in Adelaide’s Grand Final victory. Showed she has a long and bright football future ahead.